Well, it sure took them long enough, but the Yankees are in sole possession of first place in the AL East for the first time since, well, the year before I was born! So I thought that was as good a reason as any to put on my Yankee shirt and cheer on my favorite team (along with my favorite player, Joba Chamberlain). Then I took my first steps toward becoming a Yankee player myself by trying out the new T-ball set that Mom and Dad got for me. Hey, I might still have a lot to learn, but Dad says I'm already a better (and cleaner) player than Jason Giambi was! Here's a look at me showing some of my Yankee (and Joba) spirit, along with footage of me taking whacks at the T-ball set. Hi again. 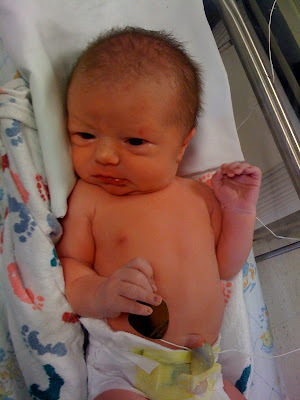 I spent quite an eventful three nights in the hospital, shutting back and forth between the nursery and Mom's room. I bonded with Mom and Dad during feedings, and also spent time with both sets of grandparents and my sister Julia. Out of all of them, I have to say I really have eyes (and what big eyes they are!) for Julia. She was always bouncing around the hospital room, chatting a mile a minute and full of energy. I can't get enough of her. I'm home! And I must say, I'm proud of the fact that I managed to pee on dad for the first time, right before we left the hospital this morning. My first impressions of my new home are quite good. I see a lot of things that I can spit up on, drool all over, try to eat, knock over when I get older, etc. So I think things are going to work out just great! Hello there! I know I wasn't supposed to arrive for another week or two, but it sounded so much fun out there that I decided to jump the gun. Plus I hear that my sister also was born on the Friday before Memorial Day weekend, so I had a family tradition to uphold. Anyway, let me introduce myself: I'm Henry Joseph Lynch, and I was born today at 8:25 am, weighing in at 8 lbs. (a big baby compared to most, but almost a preemie compared to my 8 lbs. 11 oz. sister), and measuring 20 1/4 inches. I started making travel plans around 4 am when Mom's water broke; unlike Julia's birth, she was actually in labor this time around. It's been a grueling day, as you can imagine, but I got to meet some really wonderful people, like Mom and Dad, my big sister Julia, Bobbi and Dido, and Grandma and Grandpa. They all seem incredibly nice and seem to love me a whole bunch, even though they just met me. Just like my big sister has been doing for the past two years, I'll be blogging about all of my adventures, and postings lots of pictures and videos, so be sure to check back all the time for the latest news from both me and Julia.